Wednesday, April 17th & 18th. We need all dancers to come be in the group photo whether you are planning to purchase or not. All dancers need to register at hellodancerphotography.com. We will still hold regular dance classes on Monday, April 15th and Tuesday, April 16th. Those who are missing classes due to picture day may attend any class for their age group as a makeup class. Please arrive on time for your pictures! Wear your costume- but you can do your hair and makeup however you like. All other classes- No tights and shoes, we wear bare legs and bare feet. If you register for individual photos, you will have the opportunity to get multiple individual shots. 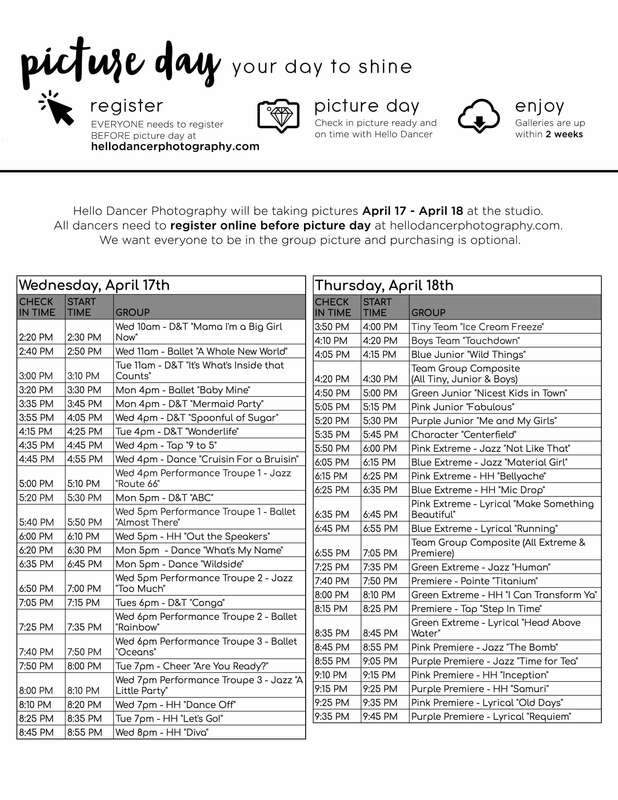 All dancers need to register online before picture day at hellodancerphotography.com. You can view and purchase your photos at hellodancerphotograpy.com within 2 weeks of picture day.